We bring the digital world to career fairs to make it easier to find the right candidates for your company faster. With a simple scan, you can have more information about career fair candidates than ever before. We know that after talking to hundreds of candidates it is difficult to remember faces–that is no longer an issue. You'll never have to sort through a stack of paper resumes again. We automatically organize all of the contacts you make at a career fair to make your job so much easier. Share all of the contacts you made at the career fair with anyone at your company with a click of a button. The data that you collect at career fairs will persist and you'll be able to access candidates from past fairs. 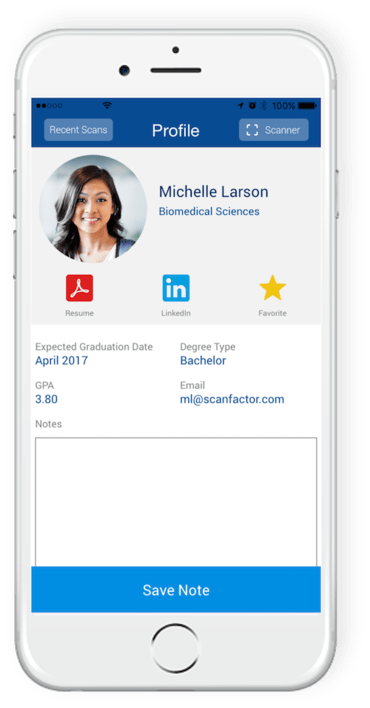 After scanning a student's QR code in the ScanFactor app, you can view the student's resume, LinkedIn profile, graduation date, GPA, degree type, and take notes on the conversation. Check out this video to experience ScanFactor from the recruiter's perspective. Visit ScanFactor.com after the career fair to view dashboards of the connections you made at the event. Easily sort and search for candidates, review candidates' experience and education, see profile photos and notes to remember the interactions that occurred. Export the data that ScanFactor collects into CSV files to use with any system or easily share. Quickly sort and filter to find the people that match the roles you are hiring for. Instantly view a digital version of the candidates resume, see their LinkedIn profile, or check out their portfolio.